The aim of the present study was to investigate strains of methicillin-resistant Staphylococcus aureus (MRSA) for the presence of the lukS–lukF determinant of Panton–Valentine leukocidin and to further characterize strains found to contain the genes. During the past 2 years, MRSA containing the lukS–lukF genes for Panton–Valentine leukocidin, particularly those emerging outside of hospitals, have become of interest. MRSA strains sent to the national reference center in Germany were investigated for lukS–lukF by polymerase chain reaction (PCR). If the presence of lukS–lukF was demonstrated, strains were further characterized by molecular typing (determination of SmaI pattern, spa sequence, and multilocus sequence type), PCR demonstration of resistance genes, and characterization of the SCCmec element. 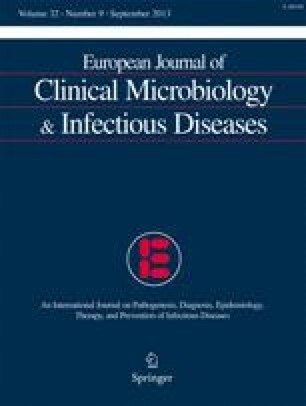 Since the end of 2002, MRSA containing Panton–Valentine leukocidin genes have been demonstrated as the causative agent of 28 cases of infection (9 community-acquired cases, 19 sporadic nosocomial cases) in different areas of Germany. Twenty-seven of these 28 isolates exhibited a unique pattern of genomic typing: all exhibited multilocus sequence type 80, spa sequence type 44, and a SmaI macrorestriction pattern that corresponds to a community-acquired strain of MRSA from France and Switzerland. In addition to resistance to oxacillin, the strains exhibited resistance to ciprofloxacin, tetracycline (tetM), and fusidic acid, the last of which is encoded by the far-1 gene. The far-1 gene was shown to be located on the plasmid. One isolate corresponded to community MRSA (cMRSA) of multilocus sequence type 1 from the USA.